Big Sport Shop.com - your store for authentic Los Angeles Lakers team merchandise. LA Lakers jerseys, shirts, jackets, hats, sweatshirts, collectibles, apparel, vintage gear, tees, memorabilia, clothing, womens and kids gear, hoodies, tailgating gear and more. 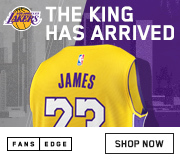 Start shopping by choosing a Lakers product category below. Click here to view another NBA team, or visit our home page for more product categories.